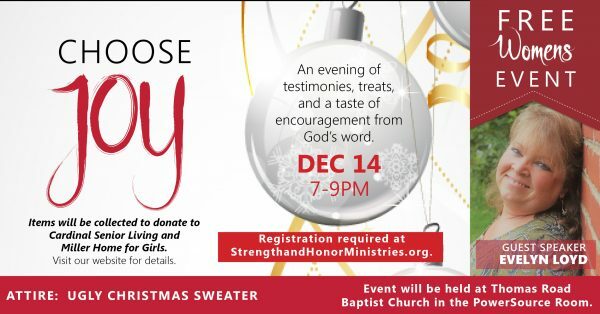 Grab your ugliest Christmas Sweater and a group of friends for our FREE Women’s Christmas Event. Join us on Friday, Dec. 14 from 7-9pm at Thomas Road Baptist Church in Lynchburg, VA. You’ll enjoy testimonies, treats, and a taste of God’s word. Guest Speaker Evelyn Loyd will encourage us to “Choose Joy” when faced with adversity and the trials of life. We’ll have special Christmas music, games, prizes for the ugliest Christmas sweater, and more! and Miller Home for Girls in Lynchburg, VA.
CLICK HERE FOR A COMPLETE LIST OF ITEMS NEEDED.